for all that is in the heavens and in the earth is yours. You are exalted as head above all. I was reading Psalm 147 when my eyes stopped on verse four, "I count the stars and call them all by name." Consider the enormity of this statement! Stars are not randomly scattered throughout space. They are grouped together in immense galaxies. The sun belongs to the Milky Way Galaxy. 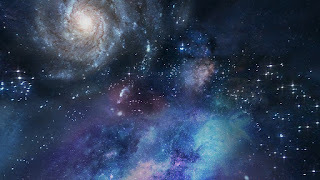 Astronomers estimate that the Milky Way Galaxy contains approximately 100 thousand million stars. Outside the galaxy, there are about 10 billion galaxies in the observable universe! The number of stars in each galaxy varies, but assuming an average of 100 billion stars are in each galaxy, that means there are about one billion trillion stars in the observable universe. This does not include galaxies of stars beyond our ability to capture them on sophisticated instruments. Therefore, we can safely say that the universe has order and was not a random happenstance, as many scientists would have us believe. Amidst these mind-bending numbers, meditate on the fact that the God of the universe cares so much for each star He created, that He gave each a name! However, God's naming of the stars should not surprise us. After all, He numbered every hair on each head (Matthew 10:30). He even knows our names for He says, "Behold, I have engraved you on the palms of My hands (Isaiah 49:16). His immense love for all His creation is beyond our comprehension, with His greatest expression of love openly displayed upon the cross of Calvary. “Oh, that men would give thanks to the Lord for His goodness, and for His wonderful works to the children of men! For He satisfies the longing soul and fills the hungry soul with goodness” (Psalm 107:8-9). "Every good and every perfect gift is from above and comes down from the Father of lights, with whom there is no variation or shadow of turning" (James 1:17). "He is good to all, and His tender mercies are over all His works" (Psalm 145:9). God has great compassion for His children, and for those who fear (honor) Him. For He knows our frame; He remembers that we are dust (Psalm 103:13-14). For God said, “In the sweat of your face you shall eat bread till you return to the ground. For out of it you were taken; For dust you are, and to dust you shall return” (Genesis 3: 19). The enemy of our soul would have those who believe in God, to also believe that He does not care about them, and that He is a distant deity, far beyond the cosmos, who has no time for them and their concerns. However, His word tells us that His plans are not for harm but to give us a hope and a future (Jereiah 29:11). We are His workmanship created in Christ Jesus for good works, which He prepared beforehand that we should walk in them (Ephesians 2:10). God goes before us and makes a way. He is with us and will never leave or forsake us. Therefore, He tells us not to be dismayed (Deuteronomy 31:8). For He will not allow our foot to slip. He who keeps us will not slumber (Psalm 121:3). His watchful eye is always upon us. There are those who ask, “If God is so good and cares about us, then why does He allow evil? As far back as the Garden of Eden, man was given the ability to choose between good and evil. Sin is the antithesis of obedience because sin transgresses God’s laws and commandments (Deuteronomy 9:7). Adam and Eve transgressed God’s command not to eat from the tree of knowledge of good and evil (Genesis 2:3). America, once known as “One Nation Under God,” has transgressed God’s commands and laws and has become a rebellious, polytheistic, multicultural, atheistic nation, that mocks God, His Word, tolerates all manner of sin, and persecutes those who hold to the truths of God’s Word. People have become so debased in their thinking that abortion and the genocide of full-term babies is sanctioned. God is calling us to search our hearts and see if there is anything that we are doing, believing, or thinking that He considers sin. It is better to repent and ask for His forgiveness then to have those sins openly exposed by God who is El Roi, "The God who sees me." No thought or action can be hidden that will not be disclosed, and nothing concealed that will not be known or brought out into the open (Luke 8:17 NIV). For He knows our thoughts before we speak them. He knows our hearts, even when we do not fully know our own heart. His love for us is so great, that He does not want us to be straddled with sin of any kind, because He knows sin’s destination. Christians commit sin. Some know full well the sin they are in and some do not recognize their actions as being sin, because the world has persuaded them that what was once wrong is now right. However, God tells us that if we are truly living by the Spirit, then we should be walking by the Spirit, because the Spirit gives life, but the flesh profits nothing (Galatians 5:19-21 ESV; John 6:63). The Spirit of God wrote the Word of God and breathed His Word into those He had chosen to record His Word (2 Peter 1:21). If we allow His Spirit to indwell us, He will be our Comforter, Counselor, Intercessor, and Advocate. He will convict us of sin. He will guide and direct us and reveal all truth. He will be our Teacher and the Spirit of life working in and through us. God is calling America to repentance. He says, “If My people who are called by My name will humble themselves, and pray and seek My face, and turn from their wicked ways, then I will hear from heaven, and will forgive their sin and heal their land (2 Chronicles 7:14 NKJV). Like David, we need to say to God, “Search me, God, and know my heart; try me and know my anxieties and see if there is any wrong way in me and lead me in the way everlasting” (Psalm 139:23-24). God is love. “All things were created through Him and for Him” (Colossians 1:16). His magnanimous love is directed to us and calls us to a life of hope, faith, truth, and obedience. May we continually recognize His goodness, mercy, and forgiveness, which He extends to all who call upon His name. PRAYER: FATHER, it is Your hand that laid the foundations of the earth. Your right hand spread out the heavens above. You call out the stars and they appear in order. Nothing is too hard for You. (Isaiah 48:13; Jeremiah 32:17). You know all things, and You know my heart. If there is any sin in my life, cause me to see it with Your eyes, repent of it, and turn away from it. For Your Word says that if I confess my sins, You are faithful and just and will forgive my sins and purify me from all unrighteousness (I John 1:9). In Jesus’ name, amen.